Anna Siemens Neufeld, 1924 Mennonite immigrant to Canada, was born on 10 December 1893 in the village of Schönwiese, Chortitza Colony, South Russia. She was the second of six children born to Julius Siemens (1861-1935) and Katharina Sawatsky (1862-1923). On 27 April 1913 Anna married Abram Neufeld (1889-1927). They had six children together, five of which survived to adulthood. Anna died on 1 November 1960 in Winnipeg, Manitoba, Canada. As a child growing up in one of the Mennonite colonies of South Russia around 1900, Anna received a good elementary education which included the domestic arts—cooking, sewing and keeping house. She was the daughter of the village mayor (Schultz) who ran his office from home and was very well known in the community. Anna was 16 when she met her future husband Abram Neufeld, who was a trained accountant. After a three year engagement they were married in Schönwiese just before World War I began. The years which followed brought dramatic changes for Mennonites in Russia. Abram was stationed in Moscow serving in the medical corp (Sanitaets Dienst) when Anna gave birth to her first child, a stillborn baby girl. When he finally returned home their second daughter was two years old. As the political and social situation in Russia became increasingly unstable, Anna and her family made plans to immigrate to Canada. With dreams of farming in Canada they left Russia in 1923. Anna and her husband Abram initially settled near Hanley, Saskatchewan where their fifth child was born. Tragically Abram died suddenly in 1927 of a ruptured appendix. Fortunately he had purchased a life insurance policy which allowed Anna to buy a house in Winnipeg, Manitoba and support her children, the youngest of which was born several months after Abram's death. It was not long though before Anna decided to move to Steinbach, a rural community with a large German-speaking population. She bought a large house on a nice piece of land with an orchard and garden. It was an ideal place to raise a family and renting part of the house to tenants made it possible for Anna to make mortgage payments. Anna as a faithful Christian, felt it was important for her children to attend church and Sunday School. Before the Schoenwiese Mennonite Church had a local congregation in Steinbach, Anna attended the Mennonite Brethren Church. Unfortunately the economic depression of the 1930s forced Anna to sell her lovely home and move into a much smaller house in another part of town. In spite of such hardships Anna was an energetic woman, determined to make a life for herself and her children in Canada. For a while she took night school classes to improve her English. She did sewing and fine needlework which produced a small income. In later years she moved to Winnipeg where she lived with her youngest daughter Helena and took care of her grandson Ernie. Anna Siemens Neufeld was a generous, faithful woman, whose independent spirit, courage and perseverance was an inspiration for many. Rosenby, Helen Neufeld. "Anna Siemens Neufeld (1893-1960)." Preservings No. 10 Part II (June 1997): 61-63. Brown, Sharon H. H. "Neufeld, Anna Siemens (1893-1960)." Global Anabaptist Mennonite Encyclopedia Online. March 2006. Web. 26 Apr 2019. http://gameo.org/index.php?title=Neufeld,_Anna_Siemens_(1893-1960)&oldid=93054. Brown, Sharon H. H. (March 2006). 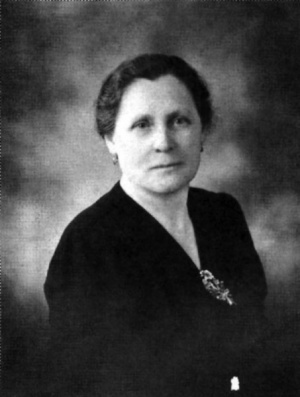 Neufeld, Anna Siemens (1893-1960). Global Anabaptist Mennonite Encyclopedia Online. Retrieved 26 April 2019, from http://gameo.org/index.php?title=Neufeld,_Anna_Siemens_(1893-1960)&oldid=93054.